This Ming concubine tomb is tucked behind and between Dingling and Zhaoling mausoleums in the western part of the Shisanling area. No official road or path will take you there, so a little adventurism is required to get on location. Like most of the consort tombs, tomb #6 has not been maintained and very little remains of the original structure. The state of dilapidation gives a hint of how old the mausoleum is. The overview photo (right) was shot from a vista point between the inner- and outer walls and looks southeast with Dingling in the background. The casual observer can still spot the inner wall contour of consort tomb #5 from this elevated angle, but from the ground level the ruins of the inner wall merely look like terrace reinforcements arranged for irrigation purposes by the local farmers. The tomb has three main sections; the lower part, which contained the ceremonial hall, the central part which contained the stele and tomb mound, and, furthest back, a steep incline up to the back part of the surrounding wall. The basic layout is similar to that of consort tomb no. 1 except that tomb 6 does not appear to have had eastern- and western store rooms in the front section. Or, if it did, then by now there is no trace left of them. Most of the original tomb has long since disappeared and the area has been incorporated into a farmer's arable land, mostly used as an orchard. The preserved parts are only the front stele -as good as new-, ruins of the inner wall and ruins of the back side of the perimeter wall. The tomb mound can also still be traced. If all else should fail then at least the stele is easy to locate. It is a little taller than 2 meters and in perfect condition; it sticks out clearly inside the orchard. Moreover, it is close to the traversing walk path (no. 6 on the blueprint) and hence easy to get to. 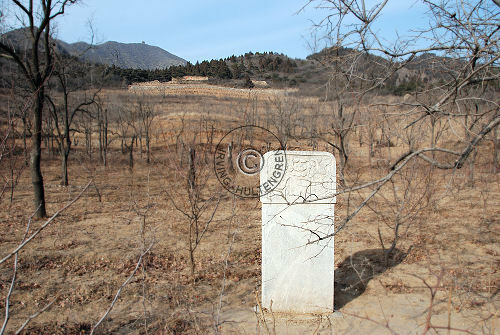 The are no inscriptions on the stele, as is also the case with other memorial steles of the Ming dynasty. The top part however leaves no doubt that this is a consort tomb. 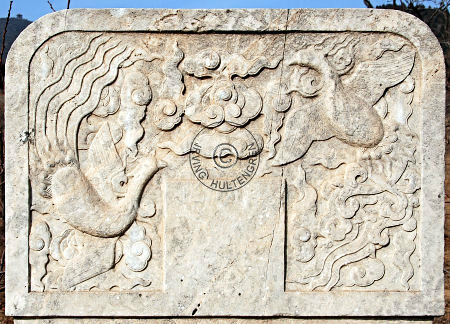 Instead of the dragon figures used for the Emperors' mausoleums, this stele is decorated with two phoenixes, traditionally symbolizing the empress -or, in this case, the concubines. The birds are beautifully depicted in flight with swirling clouds around them. The decorations are identical on the front- and backside of the memorial stele top. Only ruins of the rear section of the surrounding wall are still extant. There are no pieces left of the side- and front sections. Getting up close, however, the back wall reveals its past glory from some 400 years ago. 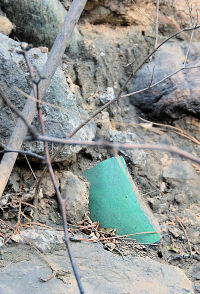 The original plaster painted in the imperial vermilion color can still be traced, large sections are still standing, the original brick are still extant, some even with the manufacturer's chop inscribed, and here and there shards of the once magnificent top cover of glazed, colored tiles can be found on the ground. 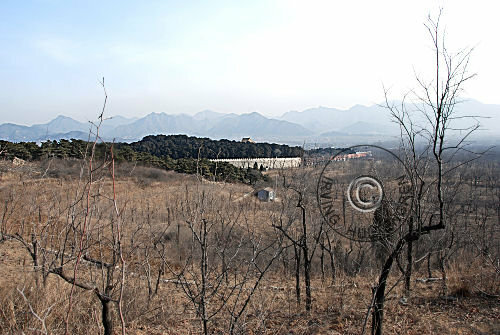 Albeit far from the immense difficulties involved in constructing The Great Wall, the rear section had not been easy to erect because of the steep incline in the hillside at this particular location. The builders demonstrated their skill in constructing a durable wall by alternating the direction of the brick in the various layers, as evidenced by above photo. The wall must have been impressive when it was built in the first part of the 17th century. The original vermilion paint would have signaled the importance of those occupying the mausoleum. By now, only a small painted section remains on the rear wall. The main body mass of the wall was however not the large brick common for Ming. The builders instead used a lot of "filler" rocks, shards and broken tiles as the basic body foundation and then for appearance purposes they used the "nice" brick as surface cover. On top of those came the vermilion painted plaster. Why did this otherwise well constructed wall vanish? One of the possible answers can be found below. 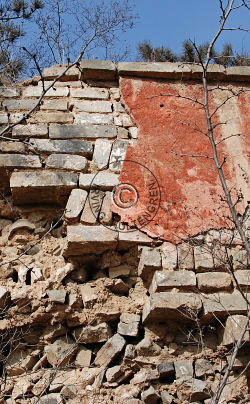 The inner wall still exists in part. Local farmers have created terraces up the hill side in order to expand the available surface for cultivation, so the distinction between an inner wall and a much more recent terrace wall is hard to see. 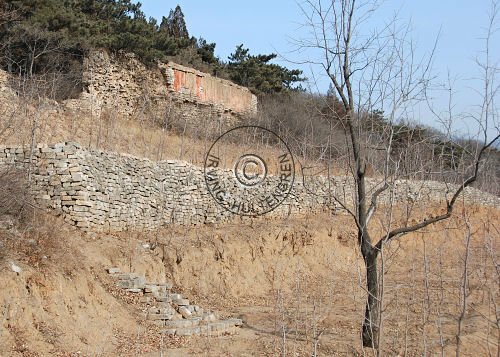 But climbing up the hill side it soon becomes obvious what happened to some or all of the old Ming brick from the perimeter wall. The farmers simply used them to create terraces, which could contain the soil. Apparently, only one female consort is interred here. 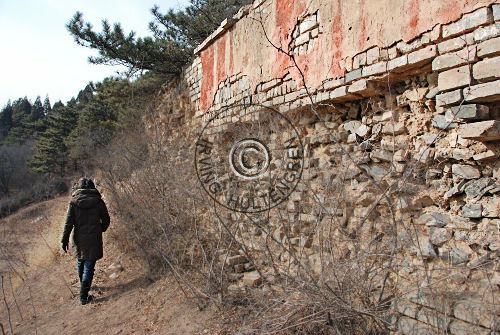 Logic would lead one to guess that it would be a concubine of either the Longqing Emperor (r. 1567 - 1572) or the Wanli Emperor (r. 1573 - 1620), since the consort mausoleum is located right between the tombs of these two successive emperors. The occupant is however a consort of the Yongle Emperor, himself interred in Changling. I do not know which one of his 26 consorts lies here. The location of this concubine tomb, despite being tugged between Dingling and Zhaoling, thus makes sense as it is situated far to the west of Changling, then the only mausoleum in Shisanling necropolis. Had it not been so dilapidated, then this consort tomb would have made a fantastic contrast for visitors to Zhaoling and/or Dingling.